In the last couple of months I’ve jumped on (belatedly) to another KS, made a couple of eBay ‘bargain’ buys and bought new stuff from retailers. Stonehaven Miniatures KS for a load of Halflings – this is in addition to the Oathsworn KS stuff AND Conan AND Zombicide Black Plague (oh, and High Heavens finally arrived – read “nearly 40 28mm gods and goddesses to paint.” More on that KS later). Did I mention the Warbears and Stagriders KS? Jumped on that one too. And I haven’t mentioned any of the non-28mm specific KS or purchases I’ve made! 20mm! Contacted David at Splintered Light with a view to ‘completing’ the whole range of Woodland Folk sculpted by Bob Olley. See some earlier paint-ups here and here. Clearly, David, fully understanding the collector syndrome, was more than happy to pull together an order with a single sculpt of every miniature in the range that I do not already have. I say 20mm but as owners of these miniatures will know, being anthropomorphic ‘beasts’ their real-world scale is dubious at best and they can happily be fielded alongside 15mm or 28mm. All depends upon how you envisage the ‘magic’ that makes these creatures human-like – does it increase their size as well? Anyway, aside from the crazy buying spree I’ve been trying to finish off these Dark Elf (15mm Demonworld) cavalry for a couple of weeks now. For some reason it takes me so much longer to paint a.) cavalry and b.) units sharing the same heraldry. I think I loose a bit of impetus along the way. 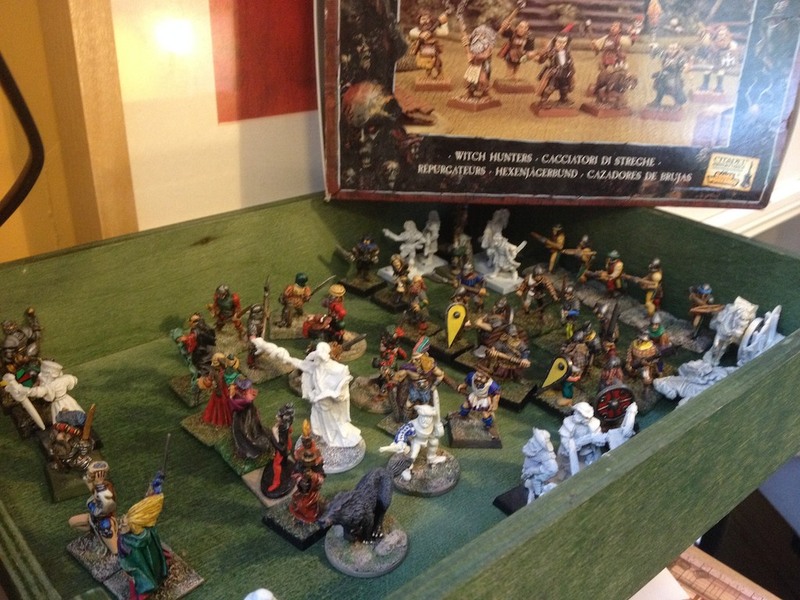 Part of the reason for the fuelled 28mm transition it an increased interest in smaller scale fantasy skirmish games – Frostgrave and the like. 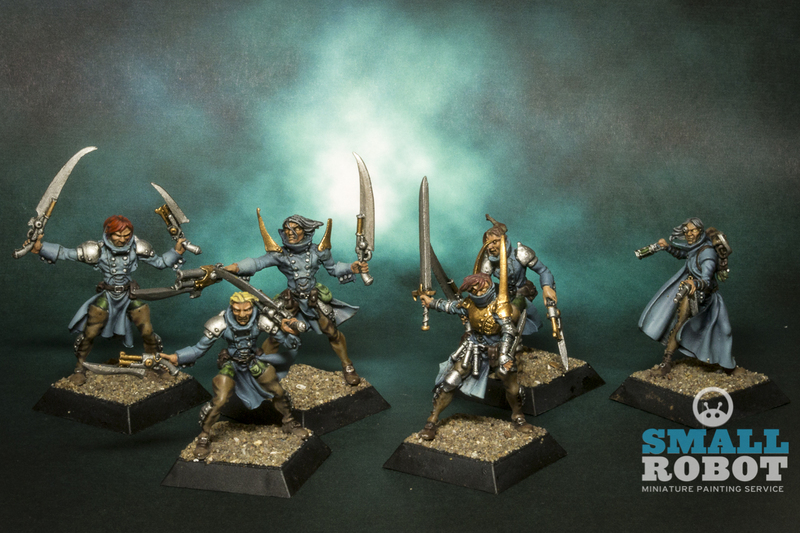 (Yes, I know I’m well placed to do all those games in 15mm – and I will – but part of me wants to start gaming with ‘real’ people and the majority there will be doing so in 28mm). 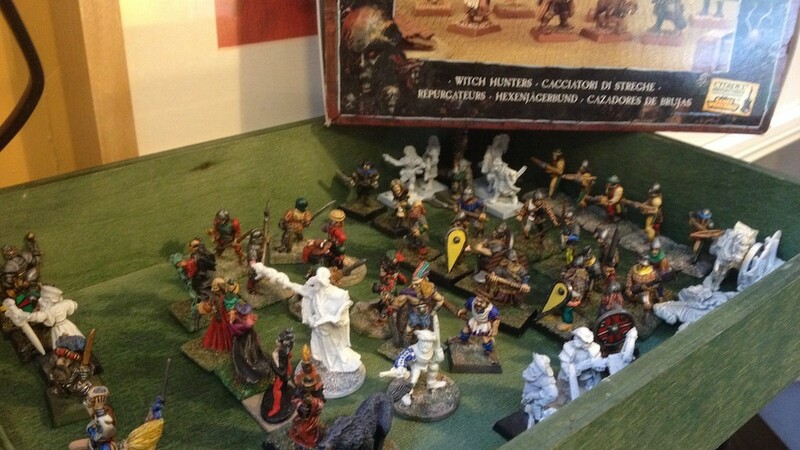 So I rummaged around some of my older miniatures (when I say older I mean OLDER. Probably older than many of the people reading this!). I’d forgotten I had a box set of Witch Hunters from the Mordheim GW game which are really nice models (and go for a mint on eBay) and are now ready for painting. Additionally a box set of Rackham Griffon chaps which are equally brilliant. Both will help make an rather nice warband or two. 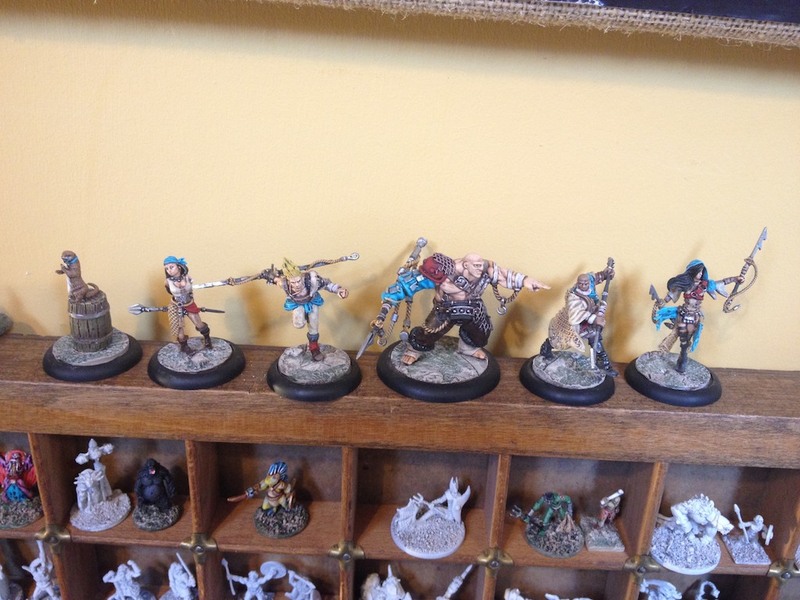 In a similar bid to be more 28mm-friendly are the Guildball miniatures. The KS was a while ago and I jumped in for a few teams. The Fishermen below are ‘table-ready’, probably at about 80% complete. They will probably stay that way until I get another team or 2 done to the same standard so I can actually play a game with painted miniatures. All the others are prepped, assembled and undercoated ready for colouring in. Enough waffle for now. Here’s to a splendid 2016 to all! Lead and plastic! As you will know a lot of the boar shame stuff is plastic and I struggle to justify putting the same effort in to some of those. Call me a snob. And I should say, apart from the Guildball KS purchase a while back, it’s partly you and Sam that are fault for starting to get me back into playing again. True, I think Sam could be swayed to 15mm , but the majority rule is 28 after all. Hope to see you both in the NY sometime. Perhaps for an Infinity primer. 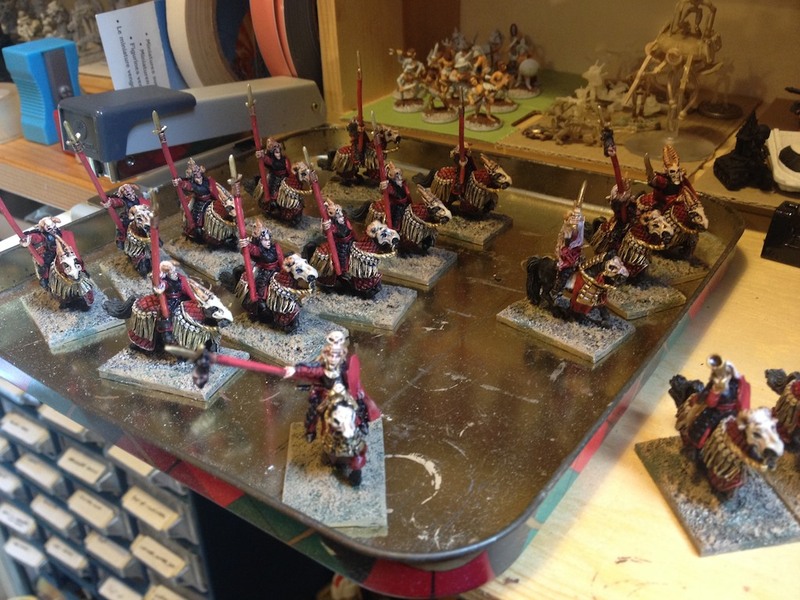 Well, we’re sort of converging – I’m still painting 20mm chariots!